I feel fortunate this year to be asked to help in my friend Eric’s garden. Helping out means not just the satisfaction of planting something and watching it grow. All that backbreaking work does pay off though, in the freshest, crispest, brightest produce imaginable. This weeks bounty was radishes, thyme and chives. So that is what this salad consists of, and it was perfect. Conjuring up dishes based on what is available is a bit like “Iron Chef Home Garden Version”. Thankfully the brussels sprouts and the rhubarb were not maturing at the same time. 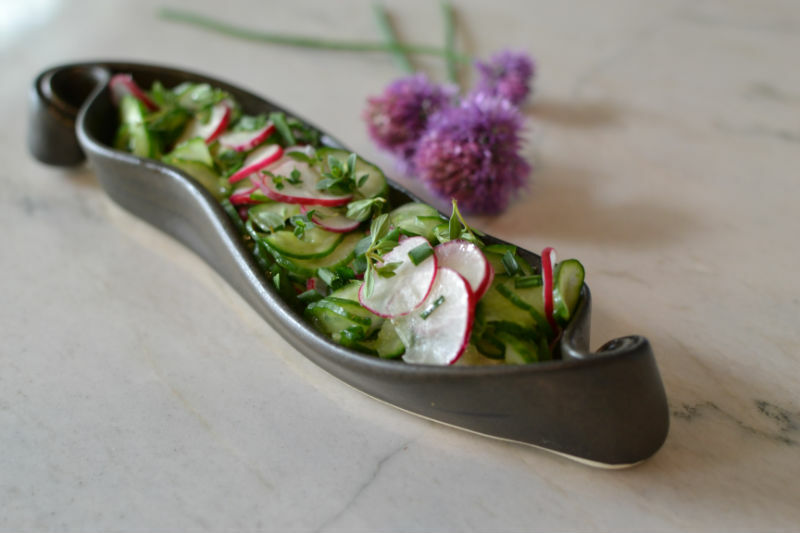 Wash and slice the radish and cucumber, layer in colander and sprinkle with kosher salt. Let sit 30 minutes or up to 1 hour to let excess liquid drain off. Lay in clean dish towel to absorb any surface liquid and wipe off as much salt as you can. Place in serving bowl, add thyme, chives and pepper. Drizzle with olive oil and lemon zest and toss well.